Why was my self-help question closed as off-topic? One of my questions was closed as Off-Topic. Questions about the behavior of an individual person are off-topic. If you are concerned about a potential medical issue, please seek the advice of a medical professional. What does this mean? Why was my question closed? Can it be reopened? Stack Exchange in general discourages questions that are "too localized", meaning that they only likely apply to a small set of people, and will not be very useful to future visitors looking for material on that particular topic. Since everyone is quite different, it's difficult, if not impossible, to generalize advice, and even if we could, we shouldn't. Can't we just try our best and dispense what we think will work? Well, why shouldn't we, this is the internet and people come to Google first for help all of the time, right? Certainly, I can fix my own brake hydraulics in my car using instructions from Joe's Auto-matic.com (sorry Joe), but I'd hate to put my own safety at risk by not taking the advice and harnessing the experience of a professional who deals with this type of thing all of the time, and is certified to do so. Likewise, in cases where you are seeking help, you should seek advice from a doctor or licensed mental health professional who can see you in person, learn the important parts of your history (medical, social, and psychological, without you having to share it with the interwebs), and can tailor a treatment or other plan that is right for you. How can we tell if your "brief funk" isn't due to an autoimmune disease, and someone telling you "just smile your way out of it and read Aaron Beck's books at bedtime" isn't going to put you in danger? We're thinking of your own safety here, and not in a patronizing way, but in an "it's your own safety" kind of way! But, you ask, what if the person answering the question is a licensed doctor, psychologist, therapist, or nurse practitioner? Well, laws vary in terms of right to practice under certain conditions, and any quality clinician should want to see you in person, at least once. I think you would find that most responsible clinicians, even if they could treat over the internet, wouldn't risk their license to provide you with sub-optimal care anyway. But, you ask, what if the question is not really a self-help question - it is a question about someone else, or about a group of people? Well, keep in mind that while you may not be concerned with your own safety when asking questions about others, a concern for safety remains for other readers of the post. To form a diagnosis, a mental health practitioner typically consults a checklist of possible symptoms. In asking a question about an individual, you may not include all the needed information, and when asking about someone else, may not even have access to it. At the end of the day, this is a Q&A forum, and is simply not designed for the interaction necessary for a valid diagnosis. The good news is, any questions regarding conditions in general are fine. Feel free to ask about the prognosis for a certain condition, the biopsychosocial basis of it, pointed questions about current research, but just keep it to questions that will be useful to someone else in the future, and in general, have some scientific or clinical basis. Someone else in your shoes who searches for information on it in the future will thank you. 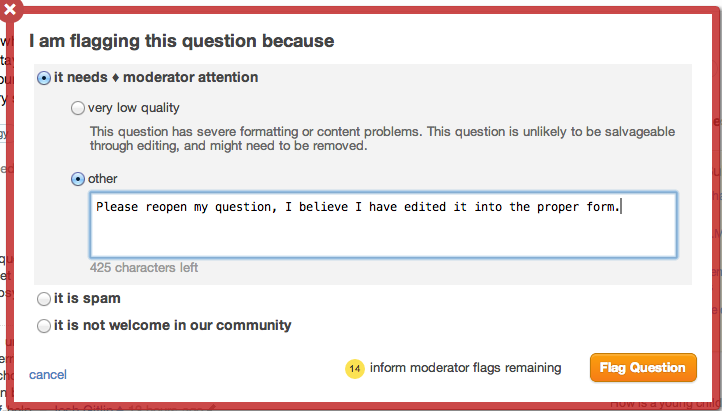 Remember that closed questions can be re-opened if they are edited and improved. You can edit your self-help question and change its form so as to remove anything personal in nature and frame the question scientifically, asking about the causes, prognosis, the biopsychosocial basis, or specific details about current research. Then, respond to some of the comments asking for feedback/reopen votes, or use the "flag" link to request moderator feedback. This is a site for people studying and learning about the mind and brain; both askers and answers are generally expected to be interested in the mind and brain in the general case. Mental health is on-topic but issues specific to certain people are too localized to be of general interest to the scientific community (a good yardstick for appropriateness on this site) and, above all, we cannot give medical advice. The problem with psychological health issues (much like physical health issues) is that symptoms and treatment vary significantly between individuals. There is rarely a single treatment or set of criteria that uniquely and perfectly diagnose all diseases. This is why it's important for such issues to be treated by medical professionals; most psychologists are researchers, not psychiatrists. While psychiatry is on topic on this site, all users are not medical doctors and medical advice is not and should not be given on this site. Think of this site has a discussion between students and professors. You could ask your professor all sorts of questions about the mind and even about mental disorders, but not about solving your own mental health issues; he's not your therapist or doctor and neither are we. Now, as I just implied, questions about mental health are on topic. General issues like this are studied and discussed in a way that is generally applicable, so these are okay topics. The problem comes when applying these findings to specific people; if your question can be generalized to be a question about research on the topic it may be acceptable. Go ahead and edit a closed post (closure essentially means "this needs editing before it can be answered here") and either comment that you think it's ready to be reopened or flag it for moderator attention if your post is improved but gets no attention after a bit. However, if you do ask a question about a mental/physical health condition you do have or believe you have, treat the resources on this site as what they are; academic and scientific information, not medical information. For those looking to ask self-help type questions, you might want to consider Personal Productivity SE. While mental health type questions are off-topic there, things that relate to personal productivity such as optimizing memory or learning are welcome there. If your problem is an interpersonal issue, then you can ask in Interpersonal Skills. Another resource I recommend is Kletische. For example, Why You Should Recognize Verbal Jabs but Not React. You can also visit their subreddit. Just a note: although you will find many interesting topics in both sites, be mindful and only read what relates to you. Don't let yourself sink in it, because you won't remember much after a while, and you will waste your time. Not the answer you're looking for? Browse other questions tagged support faq closed-questions . This site is for discussion about Psychology & Neuroscience Stack Exchange. You must have an account there to participate. Can I ask here about ghost? Link list for self-help questions? What should our custom “Off Topic” close reasons be? What exactly is a self-help question? Can I discuss my 'symptoms' on the website? are questions about neurodiversity/behavior issues acceptable here? Why is the only off-topic option CS.meta? Why was/is “Should “just asking” as a reason for asking a particular question be strictly considered to a (unrealized) false statement?” off-topic? “I have X, how common is X?”: self help question, or not? Should we close poorly researched questions? Why is the question about women rejecting unsuitable man about individual person? Why was my question closed as “not framed in psychology or neuroscience”? Are questions about preparing for a psychology degree on topic?